Sinai ISIS cell uploads new video of alleged Mossad spy being made to dig his grave in the sand before being shot point-blank. Following Islamic State's (ISIS) gruesome tradition, an affiliate of the terrorist group operating in the Sinai Peninsula has released a flashily produced execution video of an alleged "Israeli spy" being forced to dig his own grave in the desert. Ansar Bayt al-Maqdis, the Sinai terror group that last November pledged allegiance to ISIS and changed its name to Sinai Province, uploaded professionally edited footage showing the man they accused of being a Mossad spy being murdered, reports the Daily Mail. 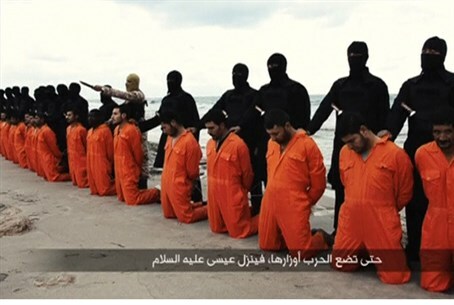 The video begins with a montage of the bearded man dressed in the classic orange jumpsuit ISIS uses for its victims digging his grave in the sand, and then cuts to the moment he apparently was captured by the terrorist group. He is seen in a lilac shirt speaking on a phone in Arabic under duress, while a masked and armed ISIS terrorist sits next to him. Then he is seen standing in a deep hole in the desert, digging his grave. The victim is then shown in slow motion on his knees muttering to himself while the masked terrorist comes up behind him, and shoots him in the back of the head with a handgun. He is then buried in the grave he dug, with the terrorist using the same spade to cover his body. It didn't take long for the video to be used in ISIS's intensive online recruitment campaign, with supporters of the terror group sharing the video near and far on social media. They claimed the victim had been a spy for the Mossad, reporting to Israel on the movements of the ISIS cell in Sinai. There are roughly 2,000 terrorists in Sinai Province, which had previously been affiliated with Al Qaeda before joining ISIS. The group has also developed a presence in Gaza, where it has has launched attacks against Hamas and threatened to destroy it.